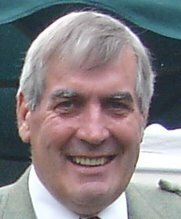 The Society has a new Membership Secretary, Bill Stewart, appointed at yesterday's Annual General Meeting succeeding Fred Kennington who had held the post for 4 years. We're sorry to see Fred go, because he has been a very capable Membership Secretary, and he was well known to many members through his work, his talks to the Society and elsewhere, and his books. Fred has 'retired' to spend more time with his wife, look after the garden and to write even more books. Bill Stewart has just retired from full time employment as a building surveyor with an architectural practice in Eyemouth, Berwickshire. Born in 1946 in the village of Ayton, Bill has spent nearly all his life in eastern Berwickshire, the only break being in the early 1970s when he spent a couple of years in Galashiels before returning again to the east coast. For the last 33 years, he has lived in Ayton with his wife, Jeanette, and two sons where he takes an active part in community life having been involved in some way with most village organisations. Bill has been a JP for more than twenty years and currently sits on the bench in the Justice of the Peace Court in Duns. His interest in family history goes back almost 20 years to the period just before his parents died when he realised that there was no record of his family history and the older generations were fast disappearing. From his research he has made contact with a number of 'cousins' living abroad in Australia and Canada and has established that his paternal grandmothers' family have been in Coldingham Parish for the past 300 years. His other interests are the Church where he is an Elder, Fabric Convenor and Clerk to the Congregational Board, Rotary where he is a Past President and current Secretary of the Rotary Club of Eyemouth and District; and Curling where he is Secretary of Ayton Castle Curling Club. In 2008 Bill toured Canada with the Scottish Rotary Curling team. In his spare time Bill enjoys walking, gardening and travel and hopes to take up golf in his retirement. Contact Bill on our Contacts page using the contact type 'Questions about Membership'.